"Dear children, to be truly consecrated to the Cross, you must be accepting of God's Will in your life, and to accept God's Will is to be holy. The hour of God's retribution is at hand, when all man's effort towards worldly gain will turn to dust. Therefore, My children, make ready your hearts in holiness through the Cross." Our Lady came dressed in a grayish-white gown. There was an angel with Her and all around Her was a circular light. Our Lady gave a private message, then said, "There are many downstairs who have turmoil in their hearts, and all this over small things. I am concerned for how they will face greater problems in the future. I ask you to pray with Me now." We prayed. Then Our Lady said: "Let us pray each day for all people in such turmoil." Then She said, "I want to bless everyone here now, in the Name of the Father, and of the Son, and of the Holy Spirit. Amen. Go in peace." Then She left. Our Lady was dressed in white and the lining of Her mantle was gray. She said: "Praise be to Jesus." I said, "Now and forever." She gave me a private message. Then She said, "Dear children, much of humanity and most countries have come to accept man's law above God's commandments. And so, I come to warn you that what you toil to produce will be of no avail. Come to value that which is everlasting. Pray, pray, pray." Then She blessed us and left. "Encourage My children to come to My Blessing Point, for it is here I will open My Heart to humanity." "Please read Acts 4:27-31 and 1 Thessalonians 2:1-7"
Our Lady had on a long blue veil with a gold band around it. She gave a private message, then said, "Dear children, I come today especially to invite you to surrender to Me all of that which is keeping you from proclaiming My message amongst others. Ask me, and I will give you the grace to fearlessly spread My message amongst unbelievers." Then Our Lady blessed us and left. "Please read 1 Peter 2:11-17 and 1 Corinthians 13"
Our Lady came to the Thursday Rosary Service dressed in a blue mantle with a white veil. She was surrounded by a bright light and was accompanied by two angels. Our Lady said: "Praise be to Jesus." I answered, "Now and forever." Our Lady gave a private message, then She asked me to pray with Her for all the people present in the house tonight. Then Our Lady said: "Dear children, tonight I come especially to invite you to love God first, and then your neighbor as yourself. If you do this, My dear little children, you will answer My call to holiness." Then She blessed us and left, and in Her place for a minute was St. Joseph. Then he, too, left. "I am Mary, Queen of Heaven and Earth--Queen of the Most Holy Rosary. All praise be to Jesus." I answered, "Now and forever." "My little child, the hour of great decision has come when those who seek to remain faithful to My Heart will need to prudently choose. Satan will divide My Son's Church upon earth. He will come clothed in reason and goodness. And you must be careful to remain faithful to Church Tradition as it stands now under John Paul II. The ensuing confusion will bring bishop against bishop, parent against child, husband against wife. Some Masses will not be valid under Church law, and many will be deceived. You will need to be strong. Persevere in Tradition as I have taught you. My mantle is over you. My Immaculate Heart is the Refuge of all who are faithful to Church Tradition. Therefore, be at peace." Our Lady came dressed in aqua and white. She said: "Praise be to Jesus." Our Lady gave a private message, then said, "Help Me to pray now for unbelievers." We prayed. Then Her rosary beads turned into drops of blood. The Blessed Mother then said to all those present here, "Dear children, today I invite you to realize the only thing of importance is God's Will in your lives and how you respond to His Will. Do not be sidetracked by the allurements of the world, or by personal difficulties. This is all Satan's confusion. I love you, My dear children, and I continue to pray for you. I am blessing you now in the Name of the Father, and of the Son, and of the Holy Spirit." Then She left. Our Lady was dressed in white brocade and She had a large angel with Her who arranged Her mantle where She came to stand. Our Lady gave a private message. Then She asked me to pray with Her for all government leaders who held the fate of millions of lives in their hands. Then Our Lady said: "I will address all the people here tonight. Dear children, I come tonight to teach you how to have peace in your hearts. You will achieve this, My dear children, if you die to your own will, and only do the will of God. Remember, God does not permit, or ordain, anything that is not the best for you." Then Our Lady said: "God the Father loves you, Jesus loves you, the Holy Spirit loves you, and I love you." Then She blessed us and left. Our Lady came dressed as Our Lady of Grace, and She said, "Praise be unto Him, Lord of lords, King of kings, Jesus the Christ." I answered, "Now and forever." Then Our Lady said: "Dear children, in My Heart is every grace you need towards holiness. Ask me, and I will give you prudence, patience, wisdom, discernment and understanding for every situation. If you do not come to me, Satan has his entry, and you do not act according to God's Will. I am blessing you now in the Name of the Father, and of the Son, and of the Holy Spirit." Then She left. "Please read Psalm 23, Psalm 32: 10-11"
Our Lady was dressed in a pearly-pink color with a gold band around the mantle. She gave a private message, then said, "Dear children, I have come to ask that you prepare your hearts to be wellsprings of faith and trust, so that any onslaught that the enemy conjures up will leave you in peace. Therefore, My little children, die to your own will and live only for the Will of God." Then Our Lady blessed everyone and left. "In this hour of decision, the smallest prayer or sacrifice can mean the difference between life or death for a soul." "My child, My messenger, I come now in praise of the Holy Name of Jesus. I am Mary, ever virgin. I come to petition the hearts of all humanity to pray, pray, pray. Never before in the history of the world has the need for prayer been so great, for the Arm of Justice descends upon earth. I can no longer restrain that which approaches. However, make your prayers copious and from the heart. Match each of My tears with fervent prayer that I may beg the Lord God to hasten His second coming, thereby shortening all that mankind must suffer. Appease My Son's already grieved Heart by bringing Him souls. Time is running out for many. The decisions made in the coming days will mean salvation or perdition to countless souls. I come to beg for them-pray, pray, pray." "Dear children, I come to invite you to bring alive this Easter season in your hearts. As you meditate on My beloved Son's passion, surrender your will to God and die to all sin in your lives. When you celebrate His glorious Resurrection, celebrate your freedom from the captivity of sin. On the feast of Jesus' triumphant Ascension into heaven, realize that your fervent prayers from the heart rise to heaven as fragrant blossoms. Then comprehend, My dear little children, that these same prayers return to earth as great graces, just as on Pentecost My heavenly Spouse returned to earth. Then you will truly be able to consecrate yourselves to the Cross, seeing in it victory." Our Lady was dressed in gray and pink, and was carrying a golden rosary with her. She said: "All praise be to Jesus," and I answered, "Now and forever." Our Lady gave a private message, then asked me to pray with Her for the people that came tonight, and for the people She called to come but didn't respond to Her call. Then She said, "Dear children, tonight I come especially to offer you the hope of the Refuge of My Immaculate Heart which is the Ark of this age against the rising tide of apostasy that sweeps across the earth. Those that seek this Refuge will not be confused and will be at peace in the midst of confusion." Then Our Lady blessed us and left. "Much of what the Church has traditionally stood for is about to be submerged. It is for this reason I will establish, through My Mother, refuges of faith. All of these are already formed in My Mother's Heart. They will be under attack from within and without, but they will stand firm." "The tide of popular opinion is about to flood the Church. Those who follow it will drown in it. But those who seek the Refuge of My Immaculate Heart will find herein a safe harbor of the true faith and dogma of the Church. See how close I am to those who cling to the true faith." She is wearing a blue mantle with white flowers all over it. These flowers represent the "pockets" of true believers She spoke about earlier. "Just as you can never retrieve a Hail Mary once said, so you cannot retrieve a Eucharist once received. Do all with your heart." "Make it known that the pockets of true believers will be scattered throughout the world." She is showing me a map with little white flowers on it. "These will be watered by the Holy Spirit and bloom in grace." At this point I asked Her to identify herself. "I am Mary, Mother of the Church. I come in praise of Jesus, King of Glory. Do not be afraid. Make it known." After Communion, I saw in My heart a tabernacle with many roses coming out of it. Jesus said, "Know that all that is good originates with Me. It passes through My Mother's Heart and comes to you as grace. Satan tries to divide you through words and ideas. But he can only succeed in this if you open your hearts to pride first." Our Lady came in gray with a dark blue band around Her mantle, and She had on a pink gown and was holding a crucifix. She asked me to pray with Her for all unbelievers, some of whom were in the Church. She then asked me to pray for all those who were suffering in spirit. Then She said, "I desire that a devotion to My Son's passion and death be developed here. I will personally consecrate the ground on which these stations will stand, and I will pray with those who recite the stations. Devotion to the passion and death of My Son is more efficacious than any sacrifice." Then Our Lady said: "Dear children, I come today to invite you to come to trust in My Heart of grace, for it is herein you will find every goodness. Pray in child-like confidence for discernment and wisdom which you will so need in the near future." Then Our Lady blessed us and left. Our Lady came completely dressed in gray and She was holding a rosary, which was the exact duplicate of the one the statue downstairs held. Then Our Lady said: "Dear children, tonight you are praying for states, but I am here to tell you that soon you will be praying for countries." She blessed us and left. "I want to teach you to be disciples of the grace of My Heart. Dear children, realize that all things are a grace and dependent upon grace. See how little you are compared to this magnificent gift. When you come to realize your littleness, I will build you up in grace to accomplish God's Will through you. I will nurture your little hearts in My motherly grace so that you will be all God wants you to be, and then you will answer My call to you." Our Lady came during the second decade of the Glorious Mysteries. She was dressed in white and She had a sword piercing Her Heart. There was also a light illuminating Her Heart. She gave a private message, then said, "Dear children, today the sword that pierces My Heart is Satan's deceit in the world. Each of your prayers helps Me to uncover him where he has remained hidden. Therefore, My little children, pray, pray, pray." Then Our Lady blessed us and left. "Please read Ephesians 4:1-4, 14-16; 5:1-3"
Our Lady was dressed all in white and was wearing the crown that the statue downstairs has on (the crown used for May Crowning last week). She said: "Praise be to Jesus, Son of the living God." I replied, "Now and forever." Our Lady gave a private message, then asked us to pray for souls that do not love. We prayed an Our Father and Glory Be with her. Then Our Lady said: "Dear children, today I invite you most especially to have hearts of love. If you love, My dear children, you will respect everyone. It is only through Satan's deceit and confusion that you do not respect and you do not love. All of this is an obstacle to grace." Our Lady blessed us and left. Our Lady came dressed in gray and the edges of Her mantle were a scarlet color. She said: "All praise be to Jesus." I replied, "Now and forever." After a private message, Our Lady said: "Let us pray now for all hearts to be at peace." We prayed. Then She said, "Dear little children, these days I invite you especially to keep your hearts centered on holiness. For it is in the heart that all sin takes its root. Therefore, My dear little children, pray for holy hearts and hearts that are at peace." Our Lady then blessed us and left. Our Lady came dressed all in white and had a great light coming from the area of Her Heart. She was also holding a pink rosary, exactly like the one I was holding. Our Lady said: "All praise be to Jesus." I replied, "Now and forever." Our Lady then asked us to pray with Her for the needs of all those intentions in our hearts and in Her Heart. We prayed. She then said, "Thank you for responding to My call. I come today, dear children, to ask you to surrender to your victimhood. Jesus is forming an army of victim souls, each soul surrendering his will to the Will of God in accepting all that God does bring. Do not allow discouragement to be a part of your crosses. Pray for courage and perseverance and pursue the path to My Immaculate Heart. I love you, My dear little children." She blessed us and left. Our Lady came in gray and gold in a material I had not seen before. She said: "Praise be to Jesus." I answer, "Now and forever." She said: "Littlest of My messengers, solemnly I inform you, Jesus sends Me to ask every heart to immerse themselves in response to My call. Satan is gripping the hearts of many and most in confusion and deceit. It is in this way, governments will be led into war and economies will collapse. Jesus desires souls to find their peace in My Immaculate Heart, soon the last Refuge of many." "Further, I inform you, all countries that have been graced by My presence in the form of an apparition will suffer more or less in the coming retribution in proportion to their response to My call to holiness. Every site of My apparitions upon earth will continue to be a blessed fountain of grace and of peace throughout much of the purification, as Jesus gives souls every chance to respond to conversion. In all of this, I will be with you." (She seems to be talking more personally to me, now.) "My Heart will surround you, and you will know your Mother's presence and guidance. Do not be afraid, but pray, pray, pray. You know well now the fruit of obedience is to disarm Satan." She blessed me and left. Our Lady was very somber throughout this visit. Our Lady was dressed in white lace. She gave a private message, then said, "Dear children, tonight I invite you to seek always the Refuge of My Immaculate Heart and the peace herein. Do not be deceived to think that you can obtain peace without God's grace. Dear little children, you must forgive. Pray for the grace of forgiveness because it is only in this way you will be at peace and be able to love as God wants you to love." Then Our Lady blessed us and left. Our Lady came dressed in white and gold and had a circle of stars over Her Head. She gave a personal message, then said, "Dear children, today I come especially to inform you the time fast approaches, indeed, the hour is here, when you must make a conscious choice to choose for the true dogma of faith. For Satan confuses many hearts to follow popular opinion rather than Church Tradition." Then Our Lady asked me to pray with Her for all God's children, that they not be deceived. Then She blessed us and left. Our Lady came dressed all in white except that the lining of Her mantle was red. She was holding a rosary and had a rosary all around Her like an oval-shaped frame. Our Lady said: "Dear children, tonight I invite you to understand that prayer is the doorway to heaven. Please open your hearts to prayer, so that the Holy Spirit can fill you with the gifts He so much wants to give you. Little children, pray, pray, pray." Then She blessed us and left. Our Lady came from heaven with two angels. She was dressed in white like Our Lady of Fatima. She said: "All praise, honor, and glory be to Jesus, the King." I answered, "Now and forever." Then Our Lady said: "Dear children, today I come especially on this feast to invite you to pray each day that the Holy Spirit renews your heart in love. It is in this way that you will be able to accept the crosses in your life as My Son accepted His Cross, and you will be at peace." Then Our Lady blessed us and left. Our Lady came dressed all in white with a dark gold band around Her mantle. She said: "Praise be to Jesus." I answered, "Now and forever." Then She said, "Pray with Me for all sinners." We prayed an Our Father and a Glory Be. After we finished, Our Lady said: "I would like to address My priest sons." Then She said, "Dear sons, I invite you tonight to renew your hearts in the true Faith, and in so doing, call your flock back to the Sacrament of Reconciliation. Uncover Satan where he is hidden in the lives of the people Jesus has entrusted to you. The strength of your ministry is measured in the numbers of confessions." Then Our Lady blessed us and left. Our Lady came as Our Lady of Guadalupe and She said, "Don't be afraid, I come in the name of Jesus. All praise, honor and glory be unto Him." I said, "Now and forever." A private Message was given, and then Our Lady said: "Dear children, I'm inviting you once again to become apostles of prayer. It is your prayers, My dear children, that are My ammunition against Satan's deceit. Therefore, little ones, pray, pray, pray." Then Our Lady blessed us and left. Our Lady came dressed all in gray and was holding a gray rosary. She gave a private message, then said, "Dear children, I come especially tonight to encourage you to pray for world peace. You do not realize how powerful your prayers are and how much I need them. Satan tries to conceal all this from you. You have the most powerful weapon on earth at your fingertips--the Rosary. But you must use it." Then She blessed us and left. Our Lady came dressed in a red gown with a white veil. She said: "Praise be to Jesus truly present in the Sacrament of the Altar." I answered, "Now and forever." Then Our Lady said: "Pray with Me please, little daughter, for all those who received the Eucharist unworthily today, and especially for priests who celebrated Mass unworthily." We prayed an Our Father and a Glory Be. She gave a private message, then said, "Dear children, today I invite you to understand God's justice is coming swiftly and completely. His justice has already been greatly forestalled through prayer and sacrifice, and so I ask you, spend many hours in front of My Son's Eucharistic Heart and pray, pray, and pray." She blessed us and left. After we prayed, Our Lady turned to everyone in the room and said, "I invite all here present today to offer the present moment to Jesus as a special gift of love." Our Lady came dressed in a white gown and a cream-colored veil. On the veil there were red swatches. While She was talking to me, I noticed that these red marks were bloodstains that were in the shapes of countries. Our Lady gave a private message, then asked me to pray with Her for all souls to choose the path of light instead of the path of darkness. Then She said, "Dear children, tonight I come to remind you that you are called to a vocation of holiness. Some government leaders do not choose holiness, and the spirituality of these countries then becomes atheistic. To choose other than holiness is to choose Satan. Many countries have chosen this path to perdition. Therefore, My little children, you must pray that every heart recognizes My genuine motherly call to holiness." Then Our Lady blessed us and left. Our Lady had a message for the people in the apparition room. She said to "Trust God's Holy Will for them." "Dear daughter, always have a heart full of love, for love is never in error. Love is the path I call you upon. A heart replete with love does not sin, but pursues God's Will in all things. I, Myself was able to answer God's call so completely because My Heart knew nothing but love. Forgive everything and you will not be in error. Then you will be at peace." Our Lady came. She was dressed all in white and was surrounded by a bright light. She said: "All praise be to Jesus." I answered, "Now and forever." Right away, She said, "Pray with Me for souls to find the path of light that leads to My Heart." So we prayed an Our Father and Glory Be. A personal message was given, then Our Lady said: "Dear children, tonight I come again to beseech you to pray fervently from the heart. The stronger your prayers, My little children, the stronger the weapon in My hand against evil." Our Lady blessed us and left. "Little daughter, Jesus desires all souls seek the refuge of My Immaculate Heart during this translation of apostasy that is sweeping through the Church. In My Heart, you will find defense of Church Tradition. Call on Me using these words:"
shelter me in the refuge of Your Heart. Protect me and give me peace." "With these words Satan will find no hospice in your soul, and I will afford you the refuge of My Immaculate Heart. Make it known." Our Lady came in white with Her Immaculate Heart exposed. She reverenced the Blessed Sacrament by bowing low before It. Then She said, "My child, My Heart is the last Refuge of the faithful. In My Heart is perfect submission to God's Will. Come to know the path to My Heart is paved with humility. For the humble, the little way to My Heart is short and without obstacle." Then Our Lady blessed us and left. In Her place for a minute was a sparkling cross in front of Her Heart. "Pray first for a heart of love, for to love is to be holy. Then pray for a heart of courage to show this love. Anything contrary to this is from Satan, and is a distraction. Those who reject you, reject me." Our Lady came dressed in pink and white and was standing on a globe of the world, and had many angels with her. Our Lady's smiling and says: "I know what's on your heart, but I've come tonight to pray for unbelievers, most especially those who have heard My messages but choose not to believe. They are not courageous in their fight against evil. My messages made them uncomfortable and they are choosing not to leave their old way of life." We prayed. Then Our Lady said: "Dear children, tonight I come especially to ask that you seek the path of holiness which is love. All the grace you need to love is in My Heart. Ask for it. I, as your Mother, desire so much to give it to you. There are many here who think they love, but are deceived, for they have not forgiven. Any thought, word or action that is against love takes you off the path of holiness. Therefore, My little children, learn to come to My Heart for all the grace you need to love and to forgive." She blessed us and left. Before and after Communion I was given the following vision. There was a narrow road which I understood was the narrow path of holiness that leads to Our Lady's Heart. Branching off this road were many side roads. These side roads seemed to go up to Our Lady's Heart at first, but then took a sharp turn downwards towards earth and away from Mary's Heart. Jesus said, "The side roads are the temptations of everyday life that each soul has. Satan's angels try to lure the soul from the straight and narrow path to My Mother's Heart. At first glance, the temptation looks good and the soul is deceived into thinking he is still on the good path. But as he is led farther and farther from holiness, he gets farther and farther from the Refuge of My Mother's Heart." 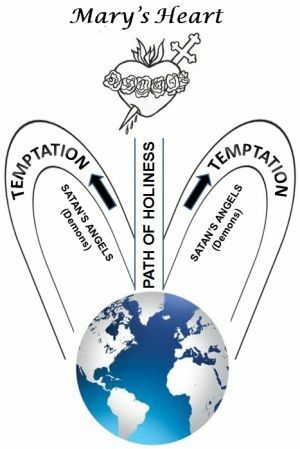 [See diagram] He continued, "Pray to be shown the temptations in your life which are obstacles to holiness." Our Lady comes in white, and bows before the Eucharist. "Dear daughter, pride is the root of unforgiveness. Pride nurtures unforgiveness in souls and makes it difficult to accept the faults of others. This is all contrary to love and is an obstacle to the grace of My Heart." After giving a private message Our Lady said: "If souls could forgive, they would be able to love. Then there would be peace in hearts and in the world. Atrocities such as abortion would be eliminated and holiness would flourish. Therefore, pray always for forgiveness and show others how to forgive." "Please read 1 John 3:11-24"
Our Lady said: "I am Mary, Queen of Peace, all praise be to Jesus." I answered, "Now and forever." She asked us to pray with Her for unbelievers. We prayed. Then Our Lady said: "I desire all souls seek the Refuge of My Immaculate Heart." Then She said, "Dear children, I assure you, hearts that are divided cannot find their way along the path of holiness. Hearts that are full of self-interest cannot be filled with the grace of humility and cannot be brought to love. Therefore, My little children, love only God, and your neighbor as yourself." She blessed us and left. Our Lady came and was dressed in gray and a cream color and had a rose pinned to Her robe slightly under Her neckline. She said: "Praise be to Jesus." And I answered, "Now and forever." Then She said, "Tonight I come to ask you to pray with Me for unbelievers, amongst whom I include the lukewarm." We prayed. Then Our Lady said: "Most especially I invite all government leaders to realize that the two greatest laws are: Love the Lord your God above all else, and love your neighbor as yourself. All earthly laws should be based on these two commandments. Remember, those who do not gather with the Good Shepherd, scatter. Those who do not legislate according to God's commandments will have much to answer for. It is not God who will judge, but the commandment that will judge them." Then Our Lady blessed us and there was a brown scapular with a cross in front of it in Her place for a minute. "Abandon all care to the Heart of My Son, trusting in His Divine Providence. Nothing depends on you, but everything depends on His provision. How foolish to spend time in concern for anything when all things are under God's domain. For this is true humility - to submit to the Will of God, which is always His provision." As Our Lady and I recited the Our Father, a great light shone from Her Heart down to earth when we said "Thy Will be done on earth as it is in heaven". Today She explained what it meant. She said: "Every grace of My Heart is the Will of God." Later She added, "The Will of God is always a grace." Our Lady was dressed in a white material I've never seen before. She said: "All praise, honor and glory be to Jesus, now and forever." And I answered, "Now and forever." She said: "I come tonight to pray most especially for souls in darkness who purposefully reject the path of light that I call them to, through their own will." Then Our Lady said: "Please pray with me." We prayed. Then She said, "Thank you. I come in particular to ask prayers that souls recognize the crosses in their lives as graces, for they are graces for other souls. Each cross brings with it the grace to accept it and to offer it for sinners." She blessed us and left. This morning when I was praying to the angel Raphael, he came and stood next to me. He had large wings, dark hair and features and was dressed in green. I asked him if he believed Jesus Christ was born in the flesh. He bowed so low his wings covered his head. He said, "I believe Jesus Christ was born of the flesh." Then he straightened up and looked right at me. He said, "And so do you." He continued, "You need to go deeper into the Mother's Heart. Do not give in to discouragement. Remember, God does not ask of you what you cannot give." I asked him how I could do this. He said, "Continually seek the Refuge of Her Heart and, in so doing, do not dwell on anything discouraging." Then he disappeared. After Communion I saw a great light come out of Jesus' Heart in a vision. At the foot of the light were three white lilies which turned into three stars. Jesus said, "These are faith, hope and love. The more perfectly you practice these virtues, the easier you will be able to trust." Our Lady told me in an interior locution, "Many times as My Son was growing up I was given to see the marks of the scourging and the nail prints on His flesh. I never dwelled on the sorrow I felt in My Heart, but I used these visions as an impetus. Each day I prayed for Him - for His public ministry and that He have fortitude and perseverance during His Passion. You must do the same for those you are praying for. Do not dwell on the lives they are leading now, but pray that their hearts be converted." Our Lady came dressed in gray and a cream color and had the rose on that we picked for her. She gave a private message, then said, "Dear children, I come especially tonight to invite you once again along the path of holiness. Please surrender your will to holiness. Comprehend with God there is no half-measure. You can not have your heart set on holiness one day and the world the next. Surrender your will completely to My call to holiness. The more complete your surrender, the more grace I can give you towards faith, hope and love." Then Our Lady blessed us and left. "For the humble, the path to My Mother's Heart is short and without restraint. For the proud, it is long and strewn with obstacles. The humble love easily. The proud are caught up in self-love." Our Lady was dressed in gray and was standing in front of a large cross. She said: "All praise, honor and glory be to Jesus, the King and Prince of Peace." I answered, "Now and forever." A private message was given, then Our Lady said: "Dear children, tonight I come especially to encourage you to come to My Heart of grace. I, your Mother, desire to give you every grace so that you can more easily support your cross in life. I offer you every grace in love. Pray, pray, pray." She blessed us and left. Our Lady came dressed all in white and She said, "All praise, honor and glory be to Jesus." I said, "Now and forever." She gave a private message, then Our Lady asked me to pray for all souls who forget to offer their suffering for sinners. Then She said, "Dear children, tonight I invite you to comprehend the only thing that keeps a soul from holiness is free will. Therefore, My little children, pray for the will to be holy." She blessed us and left. Our Lady came and said, "All praise, honor, and glory be to Jesus - Redeemer and King. I invite you to pray now for those who have not chosen holiness. For certainly they are numbered amongst the unbelievers." We prayed. Then She said, "Dear children, tonight I come especially to invite you to understand that you must make a choice between holiness and evil, for certainly those [who fail to make a choice] will find their indecision a condemnation. Therefore, My little children, pray to be holy." She blessed us and left. I see Our Lady in black. She bows to the monstrance and turns to me. Her Heart is exposed and has several wounds in it that are bleeding. She says: "All praise, honor and glory to Jesus, risen and ever-present in the Eucharist." I answered, "Now and forever." She says, 'This will be the month of decisions in the world, in the Church, and in hearts. Therefore, it is wise to pray for discernment and wisdom. Satan is spreading confusion everywhere. He is trying to destroy all good. But you will be at peace if you come as little children to My Immaculate Heart." Our Lady appeared and said, "All praise, honor and glory be to Jesus, the Word Incarnate." I responded, "Now and forever." Then She said, "My daughter, pray with Me now for all mothers who chose not to give birth today." We prayed. She spoke to me privately, then said, "I say to My priest sons: Dear sons, give Me your hearts, seek holiness with your whole heart. Come to love holiness. Please understand, My dear sons, your vocation is to bring the Sacraments to the people. If you are holy, you will understand this. Little children, always pray to be holy." She blessed us and left. "There are many bitter trials ahead. There is no peace, save in the grace of My Heart." Our Lady is dressed all in white and has a pink lining on Her veil. She said: "All praise, honor and glory be to Jesus." I replied, "Now and forever." She has angels all around Her and She has roses at Her feet. She said: "Little daughter, let us pray now for the Holy Father and that the message he brings will be planted in many hearts." We prayed. Then Our Lady said: "Dear children, tonight I come especially to invite you to realize the only path open to souls at this time is the path of holiness. All other paths lead to perdition. Remember there are no half-measures with God, and He will spew the lukewarm from His mouth. Therefore, My little children, rely on the provision of My Heart, for herein is all you need." She blessed us and left. Our Lady came during the fifth Glorious Mystery. She was dressed in many pastel colors and with a crown on Her head. She venerated the Eucharist. Then She turned to me and said, "Let us give praise, honor and glory to Jesus, King of kings, Son of Man." We did this. Then She parted Her hands and said, "I have come to inform. The bitter trials ahead include spiritual, physical and emotional catastrophes for every soul." "My Son's power to extend redeeming grace during these times is contingent upon each soul's acceptance of the crosses he is given to bear. For it is through the consecration to the Cross grace will come. Therefore, I urge My children to imitate My Son's acceptance of the Cross in love and peace." She traces a cross in the air with Her hand and leaves. A cross is left in the air momentarily. Our Lady was preceded by St. Michael, who stated, "The Mother is coming." Then Our Lady came dressed all in gold. She said: "Pray with Me for the unbelievers." We prayed. Then She requested that the people gather here at the three o'clock hour, pray the Divine Mercy Chaplet, then proceed to the Stations of the Cross (outside) and pray the Stations (on Sundays). A private message was given, then Our Lady said: "Dear children, I have come to bring souls to salvation. Therefore, I ask that you consecrate your lives to the Cross. For herein lies the grace that unbelievers need to be holy." Then Our Lady blessed us and left. Our Lady was dressed all in white and said, "All praise and honor to the Lord God Jesus, King of kings." Then She said, "Dear children, I invite all nations to pursue the path to My Immaculate Heart, Refuge of Peace. This path is prayer. Learn to depend on this path now in times of little tribulations, so that at the hour of great adversity you will know well the way to My Immaculate Heart, haven of peace for all sinners." She blessed us and left. Our Lady came in pink with a great light around her. She bowed before the monstrance and said, "All praise, honor and glory be to Jesus, the King." I answered, "Now and forever." She said: "My daughter, I come especially today on My feast to encourage souls on the path of holiness and prayer, for this path is one and the same. This path is the path to My Heart My children, in order to be holy you must love God above all else, and in so doing choose to pray. To choose holiness is to love God more than yourself. In this way, you decide for His Will above your own will. Herein then, is the secret to holiness- the secret to the path to My Immaculate Heart. Indeed, the secret that opens the door to this most solemn Refuge of sinners. Therefore, I come to invite all of My children to decide today to love God more than themselves and to pray, pray, pray. It is the only choice of value today." Our Lady was dressed all in white with Her Immaculate Heart exposed. She also has a crown over Her head. A private message was given. Then Our Lady said: "Let us pray now as I have directed you for all souls having spiritual apathy." We prayed. Then Our Lady said: "Dear children, continue to pray from the heart, most especially for the lukewarm, for this is the greatest percent of the world's population and the greatest sword that pierces My Immaculate Heart." She blessed us and left. Our Lady came dressed in gray and there are two angels with her. She said: "All praise, honor and glory be to Jesus." I replied, "Now and forever." Our Lady spoke privately, then asked us to pray for unbelievers. We prayed. Then Our Lady said: "Dear children, tonight I invite you once again to the path of holiness that leads to My Immaculate Heart. Jesus desires each soul be steeped in final perseverance. This grace is ready for everyone in My Heart of love. Please understand, dear children, in order to pursue the path of holiness, you must love God above everything and your neighbor as yourself." She blessed us and left. "All are called to a vocation of holiness, but few pursue it with sincerity. Little daughter, Jesus sends Me to invite you to be a prisoner of My Immaculate Heart - a captive of love. Reflect how each action would take on renewed meaning if you were thus confined. You would do nothing from a selfish motive but give everything to God. This is what true holiness is. And so I call all of My children to this lofty, yet attainable goal. It is here in My Heart that your crosses are transformed into grace. The deeper the soul is drawn into the recesses of this Heart, the sweeter and more pure the nectar of grace that is mediated. Therefore, I tell you, the more you love the more holy you become." "My child, I wish to cultivate in the garden of your soul the virtue of Holy Love. This virtue made it possible for the first Apostles to spread the Faith to foreign lands. It is through Holy Love the soul chooses to love God with the whole heart and neighbor as self. Holy Love enables you to look past obvious flaws of character in those you meet and see a soul journeying on the path of salvation much as your own. It is Holy Love that turns the soul away from the world and self and towards My Son." "Dear children, these days I call you to come to My Heart where I will dispense to you God's favor. I want to give you 'Holy Love' which is a love for the salvation of all souls. In this way, My little children, you will pray and sacrifice with greater fervor for all people towards their salvation. This holy, spiritual love is God's Mercy in action during this hour." "Do not flee to the mountains nor to the desert, but remain a faithful vigil where you are." "Dear children, I come still again to invite, to plead, and to implore. Open your hearts to Holy Love. It is through this magnificent virtue many can be won over to salvation rather than slipping to their perdition. This holy, spiritual love is the same love that enabled My Beloved Son, Jesus, to remain on the cross until His death. Holy Love is what enables Mother Theresa to extend herself to the destitute and the dying. My children, you cannot be complete in holiness without Holy Love, for without it all your works are empty - all your prayers mere words. Turn to the merciful Heart of Jesus and He will begin this journey of spiritual love with you." Our Lady came dressed in a blue that I've never seen before and said, "All praise, honor and glory be to Jesus, Redeemer and King." She asked that we pray now for souls that do not love. We prayed. She gave a private message, then said, "Dear children, tonight I invite you to understand that the soul is like a tapestry. The two threads running through the tapestry are holy humility and Holy Love. Without these two threads the soul does not progress in holiness and they are dependent upon each other." She blessed us and left. "When the path you are climbing seems the most difficult, remember to place your eyes back on Jesus, My Son. Everything that is occurring in your life is by the hand of God." "The door to the soul is free will. It is through this door every grace and virtue flows from the Heart of My Holy Mother. When the intellect, which controls the will, decides to believe in Satan's lies, the door of the soul closes." "The reason souls choose to believe Satan instead of My Truths is always pride." "My child, let Me explain to you further. Holy Love is to love God with your whole heart and love your neighbor as yourself. But it never exists in the tapestry of the soul without holy humility. These two virtues knit together to form holiness and bring many other virtues with them, such as patience, meekness, perseverance, fortitude, joy and peace. Working together, these virtues strengthen the soul in all that is holy. It is impossible for humility to flourish in the soul without Holy Love, and vice versa. These are interwoven to design holiness. Make it known." "My daughter, I want to pour out on humanity the grace of My Heart. Most especially, it is important souls pray for the grace of perseverance in the true faith. All manner of deceit will come against the faith in the end. It is by means of the solemn refuge of My grace-filled Heart that My children will persevere. Please comprehend, My daughter, no one is immune from Satan's attacks. Even the most holy will be severely put to the test. But I mean to defend those who call upon me." Our Lady came dressed in gold and gray, and She said, "All praise be unto Him, Jesus, the Word Incarnate." I answered, "Now and forever." A private message was given, then Our Lady asked us to pray for all sinners. We prayed. Then She said, "I speak now to My priest sons and I ask that they come to realize that they must feed their flock spiritually and not intellectually, through administration of the Sacraments. They need to pray more and be examples of holy humility, Holy Love. Priests all over the world are failing in this, through Satan's deceit." She blessed us and left. Our Lady came in gray and a gold color. She bowed before the Eucharist. She said: "Give praise, honor and glory to Jesus, ever-present in this Holy Sacrament of the Altar." I answered, "Now and forever." "My little messenger, what I most wish to convey to you is how much Jesus depends on souls who have sincerely consecrated themselves to the Cross. These souls are steeped in Holy Love and emulate the Heart of My Divine Son. Without Holy Love, souls reject the crosses in their lives, not seeing the beauty in the trials that are offered to them for the sake of others." "It is Satan who hides all of this from souls who are not child-like. For with sophistication is sown confusion and doubt. Jesus had one apostle who was sophisticated. He did not possess Holy Love, but rather love of self. Holy Love is simplistic, unselfish and unassuming. This is how Holy Love allows the soul to see through worldly goals and seek only heavenly acclaim. It is most important these days that souls see the great value of the Cross, through which salvation continually flows. Therefore, pray to be child-like in every virtue but most of all Holy Love. Let your daily bread be the joy of the Cross through Holy Love." Our Lady comes in gray and with Her Heart exposed. She said: "I am the Mother of Jesus Incarnate- the Mother of Holy Love. I come to ask My children once again to surrender completely to My call to holiness. There is no time to weigh the decision I solicit from you. Souls are in the balance. The wheat is being separated from the chaff. To choose for holiness is to choose life. Anything else is death. I come from Love to request this. Dear children, you do not realize how your decision affects the world and the future of the world." Our Lady is here in gray, and She said, "All praise, honor and glory be to Jesus." I replied, "Now and forever." She asked us to pray for all souls in darkness, that do not choose holiness. We prayed. Then Our Lady said: "Dear children, tonight I invite you to the treasury of grace, that is My Heart. Herein weave for yourselves a vestment of humility and Holy Love. Then you will see that other graces and gifts come to adorn this garment. This is the way, My dear children, to choose holiness and avoid Satan's deceit." Our Lady blessed us and left. "My dear little daughter, I want to teach you how to live in My Immaculate Heart, for herein lies the secret to holiness. If you are in My Heart you will always be at peace. Your heart will be focused on God, His Omnipotence and His Will. You will realize God's Will is in everything, even though the reason is obscure to you while on earth. You will keep your thoughts on My Beloved Son, His Passion, His life on earth, His teachings. You will not feel alone or try to solve your own problems. You cannot solve your own problems. If you are in My Heart, you will realize everything is a grace. Everything depends on grace. You can accomplish nothing alone. When you accept this in your heart, you will no longer focus on the world. You will be in My Immaculate Heart, and you, in Holy Love, will be at peace." Our Lady comes dressed as the Mother of Holy Love. She reverences the Eucharist and moves towards me. She says: "My angel, I have come to help you realize the depth of My message to you concerning Holy Love. Please comprehend that all virtues spring from holy humility and Holy Love. These two - holy humility and Holy Love - are always together in a soul. One does not exist without the other." "The great mystery of My Son's Mercy is the offspring of His Holy Love for all souls. Holy Love never is nourished by the intellect, but only in the heart. These two greatest virtues are necessary in order for a soul to dwell in My Immaculate Heart and herein take its refuge. Both of these virtues are only possible if the child of God first dies to self. The more the soul gives up his own will, the greater these virtues will be in him and the deeper the soul will be drawn into My Immaculate Heart." Our Lady is here in gray and pink and is holding a golden rosary. She says: "All praise, honor and glory be to Jesus, Prince of Peace." I answered, "Now and forever." Our Lady then said, "Let us pray now for those who perpetuate the crime of abortion." We prayed. Then She said, "Dear little children, Jesus has sent Me to ask of you extra prayers, as many prayers as you can offer, for such is the need of our Hearts. Every prayer you offer is already used up by My Son, whose Heart is greatly offended. Therefore, My little children, pray, pray, pray." She blessed us and left. Our Lady came in gray. She said: "Jesus has sent Me to ask you to offer everything you are suffering for the souls farthest from His Mercy. When He extends mercy to a soul and it is rejected, this places the soul farther from His mercy than ever. Then it is more difficult for the soul to accept the grace of conversion. It is only through Holy Love that the grace of conversion is effected. And it is through love that the soul opens the door to the grace of conversion." Our Lady came in gray. She told me, "Please take this down. Tell everyone that all grace- all virtue- flows from Holy Love. God is Holy Love. My call to you to conversion is a call to be a reflection of God- a reflection of Holy Love. It is in this way you will be united with God. Make it known." "What objectives appear hopeless, in all truth, are not through the grace of My Heart. Therefore, give praise, honor and glory to Jesus, who sends Me with these words of hope and inspiration. Pray to be holy. Be mustard seeds amongst the brambles. Do not lose sight of the goal. My dear children, if you knew the power of your prayers, you would not cease praying." Our Lady is here in white, and She says: "All praise, honor, and glory be to Jesus." She gave a private message, then said, "Jesus sends Me tonight especially to ask you to place in your heart the Consecration to the Cross and bring it to life in your lives. For it is this way that you will triumph and I will triumph through you." She blessed us and left. Our Lady is here in gray. She says: "All praise be to Jesus, Redeemer and King." I answered, "Now and forever." Then She said, "Pray with me, please, for those who do not keep holiness today." We prayed. A private message was given, then Our Lady said: "Dear children, once again, tonight I come to invite you to climb the mountain with me, the summit of which is personal holiness. That which blocks Holy Love from entering the soul is love of self. Therefore, My little children, love God and love your neighbor, die to self and ascend the mountain with me." She blessed us and left. "Dear children, I come to ask that you make of your hearts burning vigils of faith, ever mindful of Satan's attempts to undermine the true faith by means of his deceit. These days in the final struggle My adversary portrays black as white, and white as black. 'Freedom' has become slavery to sin. And My Beloved Son has been de-frocked of the dignity and awe due Him in His Real Presence on the altar. Only by the merit of your prayers and sacrifices can darkness come into the light. Therefore, My dear little children, pray, pray, pray." "Without grace you can attain no good. All goodness and love flows through the Heart of My Mother. Her Heart is the perfect Refuge all must seek to attain holiness. And holiness is all you need seek today. It is the path - the height of eternal joy. Indeed, heaven on earth." "The more the soul dies to self, the further it enters along the path of Holy Love, and the deeper it goes into My Immaculate Heart. Holy Love is the foretaste of eternal love in heaven." "Please read 1 John 3:11-18 and 1 John 4:7-21"
Our Lady is here in dark blue and white, and says: "All praise, honor and glory be to Jesus, the Word Incarnate. I've come to ask you to pray with Me for souls who do not love." We prayed an Our Father and Glory Be. Then She said, "Dear children, I come tonight to ask you to perfect yourselves in obeying the commandments - love God with your whole heart, and your neighbor as yourself - for these commandments are the embodiment of Holy Love. If all would perfect themselves in obeying these commandments, there would be no war, no disease, no abortion, and God's Will would be done on earth." She blessed us all and left. "Remember, you are being called to be a witness to trust. The secret here is to live from moment to moment, never fearing the future, for that is from Satan, nor begrudging the past, for that too is from the adversary." Our Lady came in blue and pink and stood at an angle next to the monstrance. She said: "All praise, honor and glory be to Jesus, ever-present in the tabernacles of the world." I answered, "Now and forever." She said: "My angel, draw souls into My Immaculate Heart by merit of your Holy Love. This Refuge is as close as the soul's own heart, and as accessible as the soul's will. It is here in My Motherly Heart the soul will take up its peace. Let your love for others reflect in your every thought, word and deed. In this way, they will be open to My words to you." "Now I come to tell you, My dear little children, when you come to My Heart, you come as well to the Heart of My Most Beloved Son. No one can enter this Refuge of His Mother and be rejected by Him. These days of tribulation, all who come to My Heart suffer for the sake of those who have not found their way here. But, my dearest little children, you will have joy and peace in the midst of the greatest trials. No one abides in this refuge in fear." She looks at me now. Before, She was looking up to heaven. "The more you suffer, My little angel, the more hearts will be touched with these messages." She came in white and She spread Her hands so I could see Her Heart and She said, "My daughter, the foundation of the New Jerusalem is within My Heart." Our Lady came back (dressed in white) and She spread Her hands so I could see Her Immaculate Heart and said, "Within My Heart, My daughter, is the foundation of the New Jerusalem." "Please read I John 4"
Our Lady came and said, "All praise, honor and glory to Jesus." I replied, "Now and forever." Our Lady said: "My little children, please understand that it is the soul's own will that leads it away from the Refuge of My Heart." Our Lady is here in blue and white. She bowed toward the monstrance and then stood and waited for me to finish the Rosary. Then She folded Her hands and said, "Give praise and thanksgiving to Jesus, present in the Holy Sacrament of the Altar." I answered, "Now and forever." "Child, come to understand that which I now impart to you. If the commandments 'Love God with your whole heart and your neighbor as self' are the embodiment of Holy Love, then Holy Love is the embodiment of every virtue. There is no virtue that does not flow from Holy Love. Every sin is contrary to Holy Love and leads you away from My Son and the grace of My Heart. Therefore, please comprehend, in order to turn to My Son and to holiness itself, you must first turn to Holy Love through your own will." Our Lady comes as I am finishing the Stations of the Cross. There are many flowers around Her Immaculate Heart. She says, after bowing to the monstrance, "And so, My daughter, realize the sweet fragrance of grace from My Heart disperses from the soul only when Holy Love leaves the soul's heart. For when Holy Love takes up its leave, sin enters and My grace departs. Then the soul is left to its own demise until, through free will, it turns to God once again. The Sacrament of Reconciliation opens the door of the soul to Holy Love once more. My words to you are no longer just messages, they are teachings. Go in peace." Our Lady comes in gray with Her arms extended. She says: "Holy Love transcends all other love." I said, "Do you believe Jesus was born of the flesh?" She said: "I am the Mother of the Word Incarnate. Do you understand, My daughter, My words to you lay bare the path of holiness to My Heart and the Heart of My Son for His Remnant flock? It is through Holy Love you will be signs of joy and peace in times of adversity. You can not trust if you do not first love." Our Lady blessed me and left. Our Lady is here in white with a gray gown. She bowed before the Eucharist, then turned to me and said, "Praise be to Jesus, Creator and King." I answered, "Now and forever. Amen." She said: "My daughter, pray with Me for Father's special intention." [mentioned earlier at Mass] We did. Then She said, "To have Holy Love in your heart is to be selfless and to live only for God and for others. Make all your prayers for others, and God, who is all-knowing, will see to your needs. Remember, worry is only a distraction from Satan. God's provision is always perfect. The path of peace is Holy Love. Holy Love is the Refuge of My Immaculate Heart. The means of attaining this is forgetting self." "Please read Philippians 3:17-21 "
Our Lady is here in purple and a cream color. She says: "All praise, honor and glory be to Jesus." I replied, "Now and forever." Our Lady says: "Let us pray now for all those who have stumbled from the path of holiness." We prayed. She has a very bright light around Her now, and there are sparkles coming from the light. She says: "Dear children, it is My desire that the seed of faith in your heart bloom to full capacity. Therefore, I have come to ask that you pray every day for the gift of Holy Love, so that you may proceed upon the path of holiness that I have come to call you upon." She blessed us and left. Our Lady comes with many angels and reverences the Eucharist. She turns to me and says: "My little daughter, to you is given the solemn task of praying for the remnant of faithful that even now I am gathering in the crucible of love that is My Heart. My words to you will be beacons of light that lay bare the path of holiness which leads to My Heart. Few will choose to follow. All are called. Hasten to understand, My angel, that to which you are summoned." She gave a private message, then blessed me and left. After She left, a cross of light was left in the air. I heard Her say, "I am depending on you." Our Lady is here in white and does not have a veil over Her head but Her Heart is exposed. She says: "Let us give praise, honor and glory to Jesus." I replied, "Now and forever." Then Our Lady said: "Please understand, My dear children, God's timing is perfect and the spring is here to give glory to God and to lead souls along the path of holiness through My Immaculate Heart, which stands ready to free humanity from captivity. The water will heal souls. Tell them it [the fountain] is heart-shaped and will lead to My Heart." I saw in a vision the Holy Spirit fly from a host suspended in the air upon a Bible. The Bible opened and the pages were being turned by some unknown force. First, as the pages stopped turning, they came to Acts 16 with the dove (Holy Spirit) pointing at it: then it stopped on Revelation 6 and then on Daniel 6. Our Lady is here with St. Michael- She prayed the Glory Be with us and St. Michael was kneeling in front of her. She had Her hands and eyes turned towards heaven. She says: "Dear children, I have come tonight especially to tell you that the spring will be a strengthening for the Church of Atonement, and many who come here will be healed. But it is not for you to concern yourselves concerning any controversy. For in My Heart is all the grace you need. Remember, where there is great grace, there are also great trials." "Please read Matthew 5 and John 7"
Our Lady came in white. She was in a bright light. The belt around Her waist cascaded down to Her knees in many gold stars. She said: "Let us give praise, honor and glory to Jesus." We did this. Then She said, "Dear daughter, penetrate the depths of My Heart and realize this is a spring of fresh beginnings for many. I have come to invite souls to search out what is hidden and to quench their thirst for holiness." She leaves. St. Michael came as all light except for his blue eyes. He said, "I am Michael, the precursor of grace. I am here to tell you what is about to spring forth will bear much fruit and many graces." I asked him for a Scripture passage. He told me, "Look in Acts, Chapter 17." The Scripture opened automatically to this passage because it was marked with some rose petals and a picture of one of the Medjugorje visionaries speaking at Our Lady of Lourdes Shrine. "My daughter, this is the [Maranatha] spring of new beginnings. For some it will be a sign of dispute. Jesus wants you to know this. For others it will be a conviction of heart. For most it will be a certain blessing. I am leaving two angels at this site until it is completed. This way the work will be hastened. Be pleased to know this is an endless source of grace." "Pilgrims that come here will have their hearts convinced. They will be given the choice of conversion. By this [Maranatha] spring, your life will be completely changed." Our Lady is here in light gray and pink, and She says: "All praise, honor and glory be to Jesus, My Son. Let us pray now for those who are spiritually blind." We prayed. A private message was given. Then Our Lady said: "Dear children, I come tonight once again to call you on the path of holiness. It is impossible to proceed along this path if you are not trusting. Persevere in prayer, for you can only trust one whom you know and love." Our Lady blessed us and left. After Mass, Our Lady came and said, "It would please Jesus if you would name the spring 'Maranatha'. It is a strengthening and a completion of the remnant church. Let us give praise, honor and glory to Jesus." After Mass, Our Lady came with Her arms outstretched and said, "Pray with Me for the remnant church." We prayed a Glory Be. She asked me to pray the 'Pour forth, we beseech Thee...' prayer. She gave me the following message: "It is important that My children know Jesus asks this spring be named 'Maranatha', for He IS coming. It is through the grace that flows from My Heart that the remnant church will be strengthened and protected." Our Lady came in white. She said: "Together let us give praise, honor and glory to Jesus." She turned to the monstrance and we praised Him. Then She turned back to me. She said: "Do not fear, My angel. But be aware that Satan is on the prowl. He tries to bring one against the other and comes in the guise of good. But you can uncover him in your inmost spirit. He is not peace and joy, but agitation and worry. Lay these battles at My feet. I am able to disarm the adversary through your Rosaries, and truth will spring forth. Every day include the remnant church in your works of mercy." She blessed me and left. Our Lady came in white. She said: "All praise be to Jesus." I answered, "Now and forever." She said: "Just as the grace is spilling from My Heart, so it shall pour forth from the spring, 'Maranatha'." She had Her Heart exposed. Golden rays of light seemed to be pouring out of it. She said: "Each one that comes that is to be part of the remnant church will receive a special angel for protection." She blessed me and left. "Dear child, I have come to give glory to God. Let us pray together for the Remnant church." We said a Glory Be, and Our Lady was radiant. She then said, "My child, please understand, you need to make yourselves little so that God's grace will be great. I am leading many, many to this spring, through which the grace of My Heart will pour. Jesus wants the people to know that they must be united in the grace of My Heart for the Remnant church to flourish. And so, He chooses to teach them through this spring how great the grace of My Heart truly is. You see many people coming. I tell you, threefold what you imagine will come. But your trials will multiply. Accept everything in humility and do not fear." Our Lady is here in gray and mauve. She says: "Let us give praise, honor and glory to Jesus." I replied, "Now and forever." She says: "Pray with Me for those who do not pursue their own salvation." We prayed. Then Our Lady said: "Dear children, tonight I come to invite you to surrender your will daily to the Father. You can do this, My dear children, by continually pursuing His Will and not your own gain in any situation. Pray for the remnant church, who Jesus seeks to shepherd through the grace of My Heart." Our Lady blessed us and left. "My daughter, proceed with the [Maranatha] spring as I have told you. Do not concern yourself with funds or know-how. In holy boldness, give them the plans as I have inspired you. That is your job. All else leave to me. The grace flowing from this spring [water] will cover a multitude of errors and bring peace wherever it is taken. None can prevail against the grace of My Heart. All praise be to Jesus." "You are not to concern yourself with depth or breadth, but let others determine this. Only proceed with the design as I have shown you. The [Maranatha] spring is for all faiths, all nations, all people." Our Lady came in gray. She asked me to join Her in giving thanks and praise to Jesus, truly present in the Blessed Sacrament. We did this. Then She said, "Dear little daughter, I wish to lead you along the path of holiness and still deeper into the refuge of My Immaculate Heart. Please try to consciously live every moment in Holy Love. This is how to unite your human will with the Divine Will. Everything My Son did on earth was motivated and performed in Holy Love: His Incarnation, His hidden life, His preaching, His healings, even His suffering. You can accomplish this if you live in the present moment. When Satan takes your will into the past, he conjures up grudges, which is always contrary to God's Will and Holy Love. To willfully think of the future allows Satan to bring up worries. This, then, is not trusting in God's Will. Come to comprehend, little daughter, God's Will is Holy Love. The best way to pray is to ask Jesus to let your prayers be born from Holy Love. Then He will send the Holy Spirit to engulf your heart with this precious gift." She blessed me and left. Our Lady came in gray and pink and was seated on a throne. She had many angels around her. She said: "Let us give praise, honor and glory to Jesus, Redeemer and King." We did this. Then She asked me to pray with Her for the remnant church. We said an Our Father and Glory Be together. Then She said, "My little child, come to understand everything in God's permitting Will is an opportunity to grow in holiness. If you are impatient or do not trust, God allows opportunities to arise where you can practice patience and trust. If the soul lacks humility or is self-seeking, he will be given opportunities to grow in the virtues needed. All things are God's Will and every soul is given the chance to enter the portal of sanctity. The more the soul cooperates with the grace of the present moment, the deeper they are drawn into My Heart. Make it known!" "Often you do not see the grace that accompanies trials because you are looking only at the trial. Today I invite you to see the path of holiness you are being called upon. Each trial is accompanied by grace and the opportunity to go deeper into My Heart through your response to My call to holiness, which is the practice of virtue." Our Lady is here as Our Lady of Fatima. She says: "All praise, honor and glory be to Jesus." Then She said, "Pray with Me now for all those souls who are spiritually apathetic." We prayed. She says: "I desire very much that My priest sons universally accept the encyclical of My Pope, for it dispels darkness that has cast its shadow upon the Church." She has three rosaries. One does not have any beads, one has just a few beads, and the third rosary has all its beads. Our Lady then stated, "The one [rosary] that does not have any beads represents the Rosaries that are never said. The one [rosary] that has just a few beads are Rosaries that are not prayed from the heart, and these two are the same as giving Satan power. But Rosaries that are prayed from the heart are a great, great weapon in My hands against all evil. Dear children, pray, pray, pray." Our Lady blessed us and left. Our Lady is here in white. She says: "Dear child, I have come to ask you to help Me pray for those who have already joined the Great Apostasy, for they have not accepted the Holy Father's encyclical in their hearts. Please pray with Me now." We prayed. Then Our Lady said: "Dear children, with great eagerness I call you along the path of holiness into My Immaculate Heart, so that I can lead you to the Eucharistic Heart of My Son, where you will be at peace and not fear the future or God's Justice, which advances around the world with certainty. Little children, pray, pray, pray." She blessed us and left. Our Lady was standing to one side of the altar as I prayed the rosary. She prayed the Glory Be with me. Then She said, "My child, I want to share with you a portion of the love I felt for Jesus when I carried Him in My womb. It is a love that overshadows all other desires and will not allow you to take an alternate path away from holiness. God's presence was always with Me as I carried My Son beneath My Heart. Therefore, I was never disturbed by trivialities of earth. I saw in each person I met the soul My Son would live and die for. I was embraced in Holy Love and I, in turn, embraced this love myself. If you love in this way, little child, you will be at peace and bring peace wherever you go. This is what all are called to. This Holy Love is in the refuge of My Immaculate Heart." "You can only be at peace if you are doing My Will and living according to Holy Love in thought, word and deed. Souls that reject Holy Love, reject Me." Our Lady comes in white with two angels who support Her mantle as She bows to the Eucharist. She drifts towards me, nods and says: "My angel, it is good to see you here again so soon. Please pray with Me for those who choose their own will over God's Will." We prayed. As She prayed, a bright light shone around her. Then She said, "I want to help you to further understand the mystery of Holy Love. God is Holy Love! Therefore, God's Will is Holy Love. All good proceeds from Holy Love. Without Holy Love, no good can exist, only darkness. Therefore, souls who live according to their own will live contrary to Holy Love and salvation." I asked Our Lady how can we tell if we're choosing God's Will. "God's Will for you is always Holy Love. And so, all your actions must be based on the two great commandments - Love God above all things and love your neighbor as yourself. You cannot be holy unless you live by these commandments. I cannot put holiness in simpler words. The path is now laid bare. Make this known!" She leaves. Our Lady is here as Our Lady of Fatima. She says: "All praise be to Jesus." I answered, "Now and forever." Then She says: "Pray with Me for all those who have been deceived by Satan and do not turn to prayer." We prayed. A private Message was given. Then Our Lady said: "Dear children, I come tonight to ask you to continue to pray for all My intentions. My intentions today are the same as they were when I appeared at Fatima. The serpent is on all sides preparing for war, and you must pursue the path of holiness with both feet and with your whole being. For now is the time to pray, pray, pray." She blessed us and left. Our Lady is here in blue and white. She is holding a rosary. She says: "Let us give thanks and praise to Jesus Incarnate, for all He has given us." She raises Her hands and looks up to Heaven. Together we praised Jesus, and She is bathed in a light, as She always is when She prays. She lowers Her hands and looks at me. "You see, little daughter, Jesus has allowed the Maranatha Spring to be uncovered so that those who come will be strengthened in their faith. In this way, His Remnant will be stronger and of firmer conviction. It will be easier for the Remnant to attest to the true faith and withstand opposition. But not all that come will believe or even remain faithful to Church Tradition. The apostasy is Satan's last attempt at destroying My Son's Church. But the spring will dilute the adversary's potent lies against the faith. Please be at peace." She leaves. Our Lady is here. She is dressed as Our Lady of Fatima and says: "All praise be to Jesus." I replied, "Now and forever." She says: "Let us pray now for those who have chosen the path of perdition." We prayed the Our Father and Glory Be. Then Our Lady said: "Dear children, I have come tonight to invite you to understand that My invitation to holiness is not singular, but from moment to moment. You must surrender your will to the Will of the Father and, in so doing, proceed along the path that I call you upon, that leads to My Immaculate Heart the Refuge of sinners." Our Lady blessed us and left. Our Lady came in gray and gold. She said: "Let us glorify God through this prayer." She parted Her hands and raised them to heaven. As we prayed the Glory Be, angels supported her. She was completely absorbed in prayer. Then She looked at me and said, "My angel, please pick up your pen." "Dear children, the path I call you upon moment to moment, the path of holiness that leads to My Heart, is the path of holy perfection. The tool and the measure given to attain this holy perfection is Holy Love. You will only be as perfect and as holy as you love. The obstacle to Holy Love and, consequently, holy perfection, is always self-love. Therefore, My dear children, in order to progress along the path of holiness- the path of holy perfection- you need to ask the Holy Spirit to reveal to you all the areas of self-love in your lives. Perhaps you love your reputation. Perhaps you love your ideas and opinions. Perhaps you love your appearance. None of these are lasting. Only Holy Love is eternal. Surrender to the Father all that self-love, so that He can fill you with Holy Love. Then you will be given a greater love of God and of souls. Then you will progress along the path of holiness to holy perfection." Our Lady is here in blue and pink, and She says: "All praise, honor and glory be to Jesus." I replied, "Now and forever." Our Lady gave a private Message, then said, "Please let us pray now for all those who have failed in holiness today." We prayed. Then She said, "Dear children, learn to live in the present moment, appreciating always that which is everlasting- the pursuit of holiness. Please comprehend, My dear little children, all that which you see, all that is around you is temporary and passing. Therefore, make holiness your only pursuit your only joy, and your only peace." She blessed us and left. "I render unto you the Refuge of My Heart, remedy of all affliction, safety against the foe." Our Lady came in a radiant light in white. "All praise, honor and glory be to Jesus, Redeemer and King." I answered, "Now and forever." She says: "My child, I invite you to realize that Satan's only entry into a soul is through any imperfection in Holy Love. Knowing this, I extend to you, and to humanity through you, this prayer:"
"Dear Jesus, through the Immaculate Heart of Your Mother, perfect me this day in Holy Love! Keep me mindful that every thought, word and action should come from and lead to Holy Love. Bring me along the path of holiness by means of this love, so that by loving God and my neighbor, I will attain holy perfection. I ask this in Your Name, Lord Jesus. Amen." Our Lady is here. Her Heart is exposed and She has tears coming out of Her Heart. She says: "All praise, honor and glory be to the Eucharistic Heart of My Son. My child, you need to penetrate the depths and the truths of My Heart, just as you need to penetrate the earth deeper to find the [Maranatha] spring. You need to be patient. You will know when you have reached the depths of My Heart, and you will be certain when you have found the spring." Our Lady came in gray with a red lining in Her mantle. She spreads Her hands and says: "All praise be to Jesus. I am the Mother of Jesus crucified. My angel, My little child, I invite you to further understand in your heart that Holy Love is a selfless love. It opposes the world and self. In like manner, holy perfection is a selfless perfection in that the soul chooses to perfect himself in holiness to please God. My daughter, as I, your Mother, stood beneath the Cross, I suffered everything for love of God and for souls. I suffered this way in Holy Love and it was holy suffering. Holy suffering has no regard for self, but sees only what is being accomplished for souls. The more the soul is steeped in Holy Love, the more holy his suffering. So then, even at the darkest moment, the soul sees God's purpose and unites himself to God. I am showing you all of this in the Light of Truth so that as error spreads, as it will, you can be light to others. Pray for the love of souls." Our Lady comes as Our Lady of Holy Love. She says: "All praise to the crucified Jesus, Redeemer and King." She raises Her hands to Heaven as She says this. Then She looks back to me. "My angel, it is important you comprehend the meaning of the 'Consecration to the Cross.' When you pray in this way, you are uniting all of your suffering, big and little, to Jesus on the cross. In this way you remove self from all your suffering. Then all your trials become holy suffering and have eternal value. Jesus has sent Me to tell you He wishes to make of you a particular sign to others of holy suffering. Therefore, learn to be a conduit between Heaven and earth of redeeming grace. And in all of this, the Remnant will be strengthened. This Remnant will flourish in hearts that persevere in the true dogma of faith. If you do not persevere in holy suffering, Satan will sow confusion amongst those in the ministry. It will be easier for him to foster lies, and resentments will abound. Already he has infiltrated hearts that do not know Holy Love - hearts whose every motive is self-seeking. If you are strong, you will readily uncover him. I give you now My Heavenly Blessing." Our Lady comes, but I can see only Her face. She says: "All praise be to Jesus." I answer, "Now and forever." "My little daughter, you are beginning to understand. There is a way of living and there is a way of living in holiness. There is love, and there is Holy Love. There is suffering, and there is holy suffering. There is patience, and there is holy patience - perfection, and holy perfection. The difference always being the willingness of the soul to practice the two great commandments: Love God above all else, and your neighbor as yourself. These two commandments separate the wheat from the chaff. These are the embodiment of the Ten Commandments - indeed the embodiment of holiness. To live contrary to these two greatest commandments is to leave the path of holiness that leads always to My Heart. Make it known!" "You're close to the source of the spring. You have only to probe further, and I have marked off the site of Maranatha. The front of the shrine can be designed by those in charge, for I have no preference. Only that the people be permitted to proceed on their knees at some point in prayer." Our Lady is here in gray with a pink gown and says: "All praise, honor and glory be to Jesus." I replied, "Now and forever." She said: "Pray with me, dear child for all priests, that their vocations be strengthened in Holy Love." We prayed. Our Lady gave a private message, then said, "Dear children, I come tonight to remind you to have recourse to My Immaculate Heart so that I can aid you in living in Holy Love. I want to lead you to the source of Holy Love, which is the Heart of My Son. He is the source of all good, all holiness, all love, all mercy. I am only a reflection of His most Sacred Heart. Come in confidence and I will lead you." She blessed us and left. "All of the other virtues - holy humility, holy suffering, holy obedience, holy purity, holy patience, holy perfection - every virtue comes to naught without Holy Love. For it is through love of God and love of man, virtue becomes holy virtue. There is no virtue unless it is motivated by Holy Love." "Please read John 4:34-38 and John 15:1-17"
Our Lady comes in gray. She bows towards the Eucharist and moves towards me. She says: "All praise be to Jesus." I answer, "Now and forever." She says: "My little daughter, I come, once again, to invite you along the path of holiness. To choose holiness is to begin to practice holiness, which is Holy Love. When you once begin to turn to holiness, God will give you the grace that you need to succeed. Holy Love, My daughter, is God's Will for you, and His Divine Will is Holy Love. They are one and the same. God will always extend to you the grace you need to Cooperate with His Will, and so with divine and Holy Love. Please understand, all that has happened to you so far in your life has been ordained or permitted as a means of drawing you along the path of holiness and deeper into My Heart. Let this be the moment you begin your 'yes' to Holy Love, and so, God's Will for you. Say 'yes' in a way that you are able to choose holy forgiveness. Forgive your own imperfections and forgive others' faults, as well. If you begin to choose this, God will help you through the grace of My Heart. Every thought contrary to Holy Love has its origin in evil. Make all of this known!" Our Lady is here in white and gold and says: "All praise be to Jesus." I replied, "Now and forever." Then She said, "My daughter, please pray with Me for all priests and religious who lack confidence in their vocations." We prayed. Then Our Lady said: "To My dear priest sons, I respectfully suggest they must uncover evil around them, for in every instance, to avoid this is to sanction this. Dear children, I come tonight most especially to invite you to continue along the path of holiness you are being called upon. The Alpha and the Omega of this path, this path of holiness and of Holy Love, is Divine love." She blessed us and left. Our Lady is here in white and says: "All praise, honor and glory be to Jesus." I replied, "Now and forever." She says: "Pray with Me now for those who have not chosen the Will of God in their lives." We prayed. Then She said, "Dear children, I wish to infuse into your souls holy and divine love so that you will be better instruments in My hands. Give to Me all your misgivings and imperfections." She blessed us and left. Then, as I rested in the spirit, I saw [in a vision] a number of white tongues that were at the feet of Our Lady. Then I saw these tongues come together to form a flaming sword. Then Our Lady said that the water in the spring would be a decisive force against evil and would separate the wheat from the chaff, the remnant from the apostasy. "Messenger of She who bore Me, I come to appeal to the hearts of all humanity. It is through Divine Love that the little way of Holy Love is given. This little way of Holy Love is the path of holiness laid bare for these times. Once called upon, as all are, the soul should make himself little - God and his neighbor big." "This is the path that circumvents evil and the most intricate plans of Satan. This holy simplicity finds its way as a flaming arrow to My Divine Heart, burning in its wake all self-love. Then, in Divine Love, I can mold the soul into a true instrument of grace to bear witness in the world to the truth. How I love the souls that pursue this path! It is the 'yes' of this age that will bring about My Eucharistic Reign. It is the triumphant chorus of the Remnant. It is the path of victory of My Mother's Immaculate Heart. Make this known!" "Divine Love is God in your midst. Holy Love is a reflection of Divine Love and a foretaste of heaven. My remnant church is being molded in Holy Love. Hearts that are thus formed will find their peace in Me. Though they will suffer, it will be holy suffering and I will be their strength." Our Lady is here in red and gold and has a cross around Her neck. She says: "All praise be to Jesus." I replied, "Now and forever." She says: "Pray with Me now for all souls in darkness." We prayed. Our Lady gave a private message. Then She said, "Dear children, tonight I come especially to invite you anew upon the path of holiness. I desire very much that you lay bare this path to others. Do not hold My Messages to you captive in your hearts." She blessed us and left. Our Lady is here with Her Heart exposed. She says: "I am Mary, Ever-Virgin, Mother of Jesus the Prince of Peace. All praise be unto Him." I answer, "Now and forever." She says: "My angel, multiply by a trillion what you feel today for (blank) and you will know a fraction of the anguish I feel for souls who choose darkness. Do not let his failure be your failure. Come to know, there will always be opposition to every good until Satan is defeated. But half the battle is won when you recognize the adversary at work. The victory is won when you pray against the evil. God always has a plan to overcome evil. Sometimes, much can be accomplished just by offering up not knowing God's plans in advance. This trust in God's provision can save many souls. If I can console you further, it is to say that (blank's) choices, have not been your choices for him. So do not let his failure be your failure. And this maxim holds true in all interpersonal relationships. Guilt is Satan at work. Prayer is grace at work. I encourage you to pray, pray, pray." Our Lady came dressed all in white and is holding a fifteen-decade rosary. She says: "All praise be to Jesus." I replied, "Now and forever." She spoke to me privately, then asked me to pray with Her for our countries' leaders. We prayed. Then She said, "Dear children, tonight I invite you to understand the Rosary is your armor. You are letting your personal opinions and habits take over your lives, instead of your prayers. Remember, Christ is the Center of your lives. If He isn't, then Satan is." She blessed us and left. All at once I saw St. John Bosco delivering a sermon. "My brothers and sisters in Christ, it is only through forgiveness that we are led on the path of holiness and brought deeper into the Heart of Jesus. Forgiveness summons forth God's mercy and so His love. Then He is pleased to lead the soul according to His Divine Will since there is nothing to hinder Him. Unforgiveness is like a cloak of darkness, shrouding the soul from passing into light and truth. Pray that the Holy Spirit lead you in forgiveness of others and forgiveness of yourself, so that this foreboding obstacle to holiness be forever removed from your life." Our Lady comes with many stars around her. She says: "All praise be to Jesus." I answer, "Now and forever." She asks me to pray first with Her for the remnant church, then for all the lukewarm souls who, She says: "do not realize the path they follow slips to perdition." Then She asks me to pray with Her for all cardinals, bishops and priests, most especially those who make "conscious decisions each day against faith and morals." Then She says: "My daughter, the remnant church will take its structure within the ark of My Immaculate Heart. Already, the apostasy has formed in hearts that compromise Church Tradition according to their own whims. These souls place their own will above God's Will which, in the end, will be their condemnation. Even as I speak to you the hour has struck and God's arm of justice descends toward earth. This justice will expiate every abomination and will be complete in its coming." "But you have nothing to fear if you pursue holiness with every breath. Holiness is the vindication offered a beleaguered world. Therefore, My little daughter, it is necessary that you remove every distraction from your daily routine, insofar as is possible. Be attentive to the voice of the Holy Spirit. Do everything in Holy Love for the sake of holiness. Then God, in His mercy, will take what He needs from you and add what He sees you need from Him. I am ever your Refuge in heaven and on earth. I come from Love to bring you to love, and so to joy and peace." "Dear children, today I invite you to understand that when you are relying completely on the grace of My Heart you are the strongest. It is then that you are in the Refuge of My Immaculate Heart, and I am using you in My plan of salvation. Comprehend, My children, the great love the Father has for you that He would invite you to such a call." Our Lady is here dressed all in white, and was holding in Her extended arms a large gold key. Then She said, "All praise be to Jesus." I replied, "Now and forever." Our Lady gave a private message, then said, "Pray with Me now for the bishops." We prayed. Then She said, "Dear children, your prayers are as a bridge of light which crosses the abyss between heaven and earth. You do not see their strength or know their power. You also do not see the great opposition Satan thrusts into your lives to destroy the peace in your souls, so that you cannot pray. Let your hearts be like flowers that open to the sun, so that God can fill them with peace and love and joy." She blessed us and left. Our Lady comes in gray. She says: "All praise be to Jesus." I say, "Now and forever." "Please understand, My daughter, Satan does not come into your life as himself, but in the guise of others' needs, others' judgments, others' anger. Anything that attacks your peace is not from God, but from the adversary." Here I was distracted and She left. Our Lady is here in white and says: "All Praise be to Jesus." I answered, "Now and forever." She says: "My angel, please join Me in prayer for all governments who are deceived by Satan." We prayed. Then Our Lady said: "Dear children, I invite you once again to abandon sin and pursue the path of holiness. For it is only through holiness that salvation comes. I need your prayers, dear children, for they are My weapons against all evil, and all which takes you off the path of holiness." She blessed us and left. "Please read Ephesians 4: 14-16"
"Dear children, tonight I invite you to realize that the division in the Church which fast approaches is already the division that is in hearts. It is the choice that is not a choice. It is the division between Church dogma and Traditions, and contemporary opinions. Make it known." Our Lady comes in white. She says: "All praise be to Jesus." I answer, "Now and forever." "My angel, do not judge yourself so harshly. Let God be your judge. Relinquish to Jesus all the imperfections in your family. Let the incense of your soul be Holy Love so that it is evident to all around you. Let Holy Love pour from you, engulf you and become you. I am forever your intercessor before the throne of God. I impart to you My Motherly Blessing." Our Lady comes in white. She says: "Praise be to Jesus, My angel." I say, "Now and forever." She says: "Please do not despair the decisions made by others. For while they are offered life and choose death, there are those who choose life and are put to death (now She is weeping tears of blood), and slavery to atheistic points of view presented as freedom has become the government's undoing in the majority of nations." "God is Divine Love. Holy Love is the imitation of Divine Love. In order to practice Holy Love, you must emulate all the other virtues, for it is impossible to possess Holy Love and not the other virtues. The sanctification of a soul comes from the Great Sanctifier, the Holy Spirit Himself. To practice Holy Love is to open our hearts to the Holy Spirit and so to sanctification." Our Lady is here in white and says: "Praise be to Jesus." I replied, "Now and forever." She has these flowers that are cascading down in front of her. The ones that are closer to Her Heart are larger, then they get smaller as they go down. She says: "This is to illustrate the farther you are from My Heart, the weaker the grace, and so when you depend on the grace of My Heart you are receiving all you need. I am using each of you as tabernacles of My messages on holiness, and I desire that you spread this message and be this message to all you meet. For it is here the grain will be separated, the wheat from the chaff; those who choose holiness and those who choose not to abandon sin; those who decide for the true faith, those who decide for contemporary opinion." She's showing me a long path of people - some are traveling straight, some to the right and some to the left. She says: "Only the path that goes to My Heart leads to the Heart of My Son." She blessed us and left. I heard the angels say, "Our Lady is here." I looked up and saw Our Lady in pink and white. She said: "Praise be to Jesus." I said, "Now and forever." Our Lady said: "My little daughter, I have come to infuse into your heart knowledge which you are incapable of grasping at this time. It is so the call to holiness will be complete that Jesus sends to humanity through His Mother. Each step you will be shown in subsequent messages will be complete in its entirety. Today, I invite you to open your heart as I reveal the first and tantamount step in holiness." "The first step in any journey is the person's choosing to take the journey. And so it is with My call to holiness. The soul must choose holiness. This decision is a progressive choice and yet it begins anew each day, each moment, indeed, with each breath the soul takes. This decision for holiness is the umbilical cord that links the soul to My Heart, which is Holy Love. My Heart is Holy Love (holiness). My Beloved Son's Heart is Divine Love. When the soul chooses Holy Love, he chooses to be in the Refuge of his heavenly Mother's Heart. Do not be distressed if you do not understand all I am revealing to you at this time. I do invite you to comprehend, My child, there is no salvation outside of Holy Love. Holy Love is holiness. Make all of this known!" Our Lady is here in gray and has many angels with her, and she's weeping. She says: "All praise be to Jesus." I replied, "Now and forever." Then She said, "My sorrow is that the strength of My Son's Church is hidden in disbelief and scorned, so pray with Me now for those who do not believe in His Real Presence." We prayed. Then Our Lady composed herself and said, "Dear children, tonight I invite you to understand that grace and free will must blend together in order for a soul to say 'yes' to holiness. Little children, pray that souls will consent to holiness." She blessed us and left. Our Lady comes in white and pink. She looks down at me. Her mantle is blowing as the air stirs. She says: "My daughter, let us give all praise, honor and glory to Jesus." I say, "Now and forever." "Understand, My daughter, the guardian of the soul is free will. Through free will the mind, heart, senses and members make decisions from moment to moment for or against holiness. When the soul chooses to be holy, he must at the same time choose to abandon sin. Sin is anything contrary to Holy Love. It is holy wisdom that enables the soul to see the value of holiness and to choose for Holy Love. I am opening the grace of My Heart upon humanity that more will choose for salvation, and sin will be purged from their lives. Make it known." She has a globe of the world around Her neck, suspended by two chains. Our Lady says: "You see these chains that hold the world close to the grace of My Heart. One of these is the Rosary. The other is faith-filled reception of the Eucharist. Both of these chains are weakened the more the soul chooses his own will over the will of God. I invite you today to understand the portal to Holy Love and holiness is free will." Our Lady comes in white and pink at the end of a Holy Hour. She says: "To Jesus, the praise and the glory." I say, "Now and forever." "My daughter, it is important to realize that the world is being lulled to sleep by a false sense of peace. For what appears as secure is, in reality uneasy. Errors are multiplied by errors in the Church and in hearts. Prayer is more important today than yesterday, as any appeal to you is itself more urgent. This is a war only won by consecrated lives of faith. For this reason, Satan comes against faith on all sides and tries to chase Holy Love from hearts. You will need to be a bastion of faith, hope and love in the future, and so prepare now. Put all doubts to rest, realizing the course of My call. Bring Me souls through the strength of your prayers. I am bringing those to you for you to comfort. Remember, the key to the future is trust in the present moment." Our Lady is here as Our Lady of Grace. She says: "All praise, honor and glory be to Jesus." I answered her, "Now and forever." She says: "Pray with Me now for those who do not follow the path of salvation." And we prayed an Our Father and Glory Be. She's turning to the people here and She says: "Pray much for the souls in darkness, who surround them in their daily lives. Pray and trust. Your prayers will be heard. Dear children, tonight I come especially to remind you that you live in an age of Advent, preparing for My Son's Second Coming. As you prepare for this Christmas, offer each day small sacrifices as straws in the manger; and on Christmas, He will truly flood your heart with grace. And I am blessing you now with My Motherly Blessing." "All hearts will be made whole and be made one at the [Maranatha] spring if they come in faith." Our Lady comes on a cloud. She is in bluish-gray. She spreads Her hands and says: "It is time to set all foolish goals aside and pursue holiness. All praise be to Jesus." I say, "Now and forever." Our Lady says: "Consider the goal of heaven - to bring all hearts together in the peace of the Refuge of My Heart. My daughter, all else pales in comparison. My plea to humanity now is more strong, more urgent than ever before in the history of man. Only pray that ears and hearts open in response to the grace that now waters earth in its every need." Throughout the vision there is something written beneath Her feet that I cannot make out. I ask Her now what it is. She says: "The word is 'Maranatha' (Aramaic for 'Come, Lord Jesus.')" She blesses me and leaves. "I want to take you deeper into My Heart to renew your soul and refresh your spirit. Little daughter, let us give praise to the living Christ, present in the Sacrament of the Altar. My daughter, to choose holiness is to choose God's Will and to abandon your own will. The soul abandons his own will and chooses God's will when he chooses to love in thought, word and deed. It is one step, and yet it is many steps each day. Every grace of My Heart comes from and leads towards the Will of the Father. For I am the gateway to holiness and to the Will of the Father." "Do not lend heed to doubt or discouragement." I turn over and see Our Lady. She says: "All praise be to Jesus." I answer, "Now and forever." She shows me a field of grain. The grain parts [separates] and there is a little weed growing in the midst of the grain. Our Lady says: "This is how Satan plants doubts. They begin small and grow bigger. His [Satan's] plan being to choke out My work at the House of Prayer. Always the malefactor comes to twist and deceive and cause misunderstanding concerning My messages. But I am sending angels to pluck him from your midst, so that the harvest will ripen and flourish. In all you suffer, unite it to Jesus on the cross. Never forget your vocation to bring souls with you along the path of holiness, and so to the benevolent and merciful Heart of My Divine Son." "Everyone has the same opportunity for grace. It depends upon their response to the graces in their lives as to the amount and depth of graces given on a continuing basis. So then, when you pray for the conversion of souls, pray that they respond to the graces in their lives." Our Lady comes in white, with many gold stars all over Her mantle. As She speaks, I understand in My heart that every nation of the world is represented by one of these stars. She bows to the Eucharist and turns to me, saying, "All praise to Jesus, truly present in the Most Holy Sacrament of the Altar." I say, "Now and forever." "My little child, please realize your Mother's most urgent need. That is the salvation of every soul. It is My prayer that when the great universal moment of truth comes, souls will open their hearts to this grace. Make this your petition, as well." She blesses me and leaves. "My daughter, I am the Mother of Mercy and of Holy Love. All praise be to Jesus." I answer, "Now and forever." "This, My little child, is the final step in holiness. When the soul is able to surrender his will to the Will of God, he is on the path of holiness. Then the soul makes his will one with God's Will. He accepts everything in the present moment as the Will of the Eternal Father. He views the past and the future only in terms of Holy Love, trusting in Divine Providence which is perfect in God's Will. Every sin opposes Holy Love and God's Will, and distracts the soul from the path of holiness. Therefore, ask for the grace of seeing your sins more clearly and you will better be able to avoid these pitfalls. Make this known." "I need you to mark this down. I come in this way, in these times, to tell you a moment of decision is fast approaching. All will be given knowledge of their sins. Those who do not recognize this as My Mercy pouring out on humanity will not be reconciled with Me. It is most important that you make this known!" "This is My last significant apparition site. These are the last significant messages extended to humanity. For this reason, My little child, it is important these messages be put in book form so that their distribution be more prolific. I am the Mother of All Mercy, the Mother of All Love. Praise be to Jesus." "Please read Luke 8:4-8 and 11-15"
Our Lady is here in white and Her mantle is lined in pink. She says: "All praise be to Jesus." I reply, "Now and forever." She says: "Please thank everyone for coming tonight to pray with me. Pray with Me now for souls who make gods of their own will, and so are not at peace." We prayed. "To My dear priest sons: I ask that they always keep their eyes on My Son, for His Will for them is the true dogma of faith. If their foot slips from the path to the left, they find the weeds of apostasy; to the right, the thorns of disbelief and many rocks which represent popular opinion. But I am calling them to support the true dogma of faith as it stands under Church Tradition as handed down through John Paul II. Anything else is from Satan." "To those here tonight: Dear children, tonight I come once again to ask you to make your will the Will of God, by accepting the present moment in Holy Love, and I leave you with My Motherly Blessing." Our Lady comes seated on a throne. "Let us give praise to Jesus." I say, "Now and forever." She says: "My dear little daughter, I have come today to ask you to tell everyone that too much emphasis is being placed on what is to come by God's hand of justice. People need to concern themselves with what is eternal and not what is passing. All that souls accomplish towards holiness lives forever. This is why Jesus sends me to seek publication in book form of my messages leading souls to holiness. He wants this widely circulated in book stores, and promoted both here and in other countries. The hour grows late and the need for this book is manifest by the evil which pervades earth. Therefore, I come as a mother with a final plea to Her errant children. Please make this known." Our Lady is here on a cloud. She has on a gown and mantle that are two different shades of purple, and a white veil. She had an archangel with her. She says: "All praise be to Jesus." I answered, "Now and forever." She's looking at all of us and says: "Pray with Me now for the remnant." We prayed. "My daughter, you need not fear now, for many doors and corridors which have remained closed to you in the past will now open and God's messenger [an angel] will take My words to you to the farthest point of earth. Use all My messages concerning holiness. Make prudent use of time. Do not go over past messages. I am calling many from all points, and this will be the center for many graces." She blessed us and left. Our Lady is here in two shades of blue and white, and She says: "Praise be to Jesus." I answered, "Now and forever." She asks me to pray with Her for those who are not discerning God's Will in their lives. We prayed. She has this sash around Her waist that has stars on it. She says: "They represent the countries of the world, and that the ones farthest from My Heart are receiving less grace, because they have not pleased God and they have chosen atheistic legislation." Then She says: "Dear children, tonight I invite you to understand that as you prepare for Advent you must also prepare your hearts for My Son's Second Coming. I wish for all of you to become apostles of love, living and spreading My message of Holy Love to the world, thereby converting hearts." Our Lady blessed us and left. "People who come here will be spiritually hungry. I will feed them with the grace of My Heart. The grace will multiply according to their response to My call to holiness." Our Lady comes as the Mother of Holy Love. She says: "Give praise to Jesus, who is Holy Love." I say, "Now and forever." She gives a private message, and then says: "Further, I come to encourage you in holy trust, which is the way to faith in all that is God's Will. I am building a temple in the recesses of My Heart composed of every fragment of the remnant Church. It is in My Heart I will instruct and guide them through you, and so do not concern yourself with details on how the path will be laid. My Heart is eternal. Many areas of earth will be consumed by the fire of the Holy Spirit, and safe will be the Refuge of My Heart. I am putting many things in place to begin what Jesus asks in love." "My children, I am calling you to a deeper understanding of Holy Love, so that you will know better the Father's Will. Holy Love desires holiness for everyone. It does not injure in thought, word or deed. It prescribes no action against love of God and neighbor. It harbors no contempt. Holy Love needs to be all-consuming and inspiring. The way to Holy Love is through the door of the soul, which is free will. It is surrendering your will until it becomes one with God's Will." Our Lady is here in white and gold and says: "Praise be to Jesus." I replied, "Now and forever." She says: "Thank you for surrendering your will. This surrender is sweet and will save many souls." Our Lady gave a Private message. Then She said, "Dear children, I desire every nation be reconciled to the Will of God through Holy Love, and so I will facilitate the spreading of My words to you throughout the world. Every heart is important. Jesus desires every soul find the path of holiness that leads to salvation. Therefore, little children, continue to pray, pray, pray." Our Lady blessed us and left. I saw Our Lady in gray. She was holding a globe of earth in front of her. Half of the world was all dark. The other half was light. Then I saw that the half that was light was being illuminated by Her Immaculate Heart. Our Lady said: "An eclipse of darkness is grasping and embracing the world." (I thought by darkness She meant evil.) She continued, "But see how the souls that pursue the refuge of My Heart will remain in the light. Praise be to Jesus." Our Lady is here as Our Lady of Guadalupe. The stars on Her mantle look like lights. She said: "Praise be to Jesus, My angel." I replied, "Now and forever." Our Lady then said, "Pray with Me now for those who do not choose life." We prayed. Then Our Lady said: "Dear children, choose always Holy Love in every moment and you will be in Father's Will. Remember, His Provision is always perfect. Therefore, you need not fear the future. Let Holy Love be the measure of your every thought, word, and action." She blessed us and left. "The reason people do not trust is they do not know My strength and My power. If they believed in My omnipotence, they would trust Me." I saw many angels coming from the Eucharist, floating towards me and past me with what seemed to be pieces of bread. Then I saw Our Lady come towards me holding a loaf of bread. She said: "Let us give praise to Jesus." I said, "Now and forever" She said: "This is your daily bread. It is all the grace you need towards Holy Love in the present moment. It is the strength you derive from the Eucharist, the peace you receive through prayer. Let it permeate your soul as yeast permeates this bread, and swell your soul with Holy Love, so that everywhere you go the fragrance of grace is spread." Our Lady came in gray and a cream color and Her Immaculate Heart was exposed. She said: "Praise be to Jesus." I replied, "Now and forever." I recommended to Her all those who had asked for special prayers. She said: "This was in My Heart before the petition formed on their lips." Then She asked me to pray with Her for those petitions. We did. Then She said, "Dear children, tonight I invite you to be warriors of Holy Love. Spread Holy Love wherever you go, by word and by example. For I tell you that nations shall march against nations, and one country will skirmish for boundaries against another country. But God's justice comes without discretion to every area of earth. Therefore, little children, pray, pray, pray." She blessed us and left. Our Lady is here in pink and blue, and says: "All praise be to Jesus." I answered, "Now and forever." She says: "Whenever you gather consecrate yourselves to the Cross ['Consecration to the Cross' prayer]. It is in this way that you will come to love the Cross as My Son desires. Pray with Me now for those who are not attracted to holiness." We prayed. Then Our Lady said: "My children, it is important that you realize the remnant must gather in My Heart, Refuge of all sinners, just as the shepherds gathered next to the manger on the first Christmas. For it is in My Heart, and only in My Heart, you will be able to reach the pinnacle of holiness, which I tell you today is love of God's Will for you. This is what will see you through every trial, every disaster." She blessed us and left. An archangel was here first and was holding up a book that said - Be of stout heart, prompt to forgive and slow to anger. Now Our Lady is here in white and says: "Praise be to Jesus, My angel." She says: "I've come to ask for prayers for the world situation, which is deteriorating as we speak." We prayed. Now she's turning to the pilgrims and says: "I invite you to persevere in all you pray for. Heaven is attentive to your prayers. Dear children, tonight I come to invite you to the pinnacle of Holy Love, which is love of God's Will for you. Few reach this way of holiness. All that is needed is the grace of My Heart and practice in the present moment of Holy Love." She blessed us and left. "I am calling the remnant to unite in the unadulterated Refuge of My Mother's Heart. It is here they can cling to the true dogma of faith and stand away from Satan's confusion." "There is no salvation outside of Holy Love. This is the truth My Son came to earth to reveal. All praise be to Jesus, the Word Made Flesh." Our Lady is here in gray with a white veil over Her head, and She has Her hands extended with a pearl-colored rosary in one hand. She says: "All praise be to Jesus." I reply, "Now and forever." Then Our Lady said: "My little daughter, I come to extend to mankind the invitation of understanding the benevolence of My Son's Divine Heart. It is a great grace that He comes to Seven Hills, and that He sends His Mother to Seven Hills to instruct and to guide the remnant Church. I will draw pilgrims here, through the grace of My Heart from all points of Earth, and you will see many changes. Begin to understand the extent of My call, the timeliness, and the call to love that Jesus sends Me with. Through Holy Love, I am calling all of My children into My Immaculate Heart, solemn Refuge of the True Dogma of Faith of the Roman Catholic Church. Make it known!" "Please write down what I have come to tell you. Let all the world give praise to Jesus." Our Lady is here in gold and white. "Dear children, in order to uncover Satan in the world, it is necessary to uncover him first in your own lives. The adversary is everywhere. He is in all self-love. He is in every thought, word, or action that is contrary to Holy Love. He opposes your every effort in this regard, trying to obstruct your journey on the path of holiness. Therefore, little children, you must live in Holy Love in the present moment. This will require effort and a conscious choice, as your will becomes Holy Love." She leaves. Our Lady is here in pink, gray and gold. She says: "Praise be to Jesus." I answer, "Now and forever." She says: "I have come tonight to tell you how to make your Christmas especially pleasing to My Son. I invite you to make of your hearts a manger where My beloved Son can take up His rest. Just as the star was a beacon in the night for the wise men and shepherds, let your souls be light in the darkness drawing souls to My Son. Let your gifts of gold, frankincense and myrrh be your prayers and sacrifices towards peace in the world. Then, My dear children, your Christmas will be a gift to My Son. I impart to each one of you My Motherly Blessing." "The path [of holiness] is strewn with obstacles, all of which are pride in various disguises. But when a soul pursues holiness with sincerity, he has everything." After Communion, I saw Our Lady in an interior vision. She had on gold and white, and was holding the Infant Jesus. She handed me the Infant. As She did, I saw that a silhouette of the Infant had been left on Her gown where She held Him against her. The silhouette was in blood. Our Lady said: "This represents what My Son suffers in the Blessed Sacrament, those who are martyred for the faith, and those who die in abortions." "When the soul chooses to love as I commanded, he chooses holiness. Love and holiness are one and the same. Therefore, anything contrary to love is contrary to holiness. Make it known." Our Lady is here in white and gold, and has the Baby Jesus in Her arms. Saint Joseph is here also, standing to Our Lady's right. She says: "All praise be to Jesus." Then She said, "Pray with Me for poor sinners." We prayed. Then Our Lady said: "Dear children, I invite you here tonight especially to make known the Refuge of My Immaculate Heart, the resting place of all souls. God desires that you make known this Refuge, the peace and the trust herein. For it is only by God's grace that you accomplish anything. Alone you are nothing; in My Refuge you are the strongest. I impart to each of you now, My Motherly Blessing." Our Lady is here in white and holding a rosary. She says: "Praise be to Jesus." I answer, "Now and forever." Our Lady says: "When you are uniting your will to God's Will you are pursuing the path of holiness. It pleases Me to see you accept this. The world is about to experience every kind of misfortune. Your country will experience political and economic upheavals such as it has never known, and chaos will ensue. But those who have chosen the path of holiness and pursue it in the midst of misfortune will be at peace. I was sending many to the House of Prayer who are in the midst of turmoil, all because they are not trusting, and they do not see God's Will for them. Grace will come to them, and the House of Prayer will be a balm of peace for many." "Do not be distressed over your own situation, which I tell you is in the Hands of God, Who even now foresees the outcome. Once again I draw you to the reality of the present moment. It is in the present moment that you will find God's presence most profoundly affecting your life and that of those around you. Therefore, I implore you, prayerfully seek the path of holiness in the midst of each new trial. Love and pray." Our Lady is here in gray and white and says: "All praise be to Jesus." She gave a private message, then said, "I am asking prayers now for all countries who have not seen the path of holiness, or worse, do not choose to follow it." We prayed. Then Our Lady said: "Dear children, I come tonight to encourage you once again along the path of holiness, the path which the Father has laid for you from the beginning of time. To pursue holiness is to act upon the gifts of faith, hope and love infused in your souls at Baptism. Practice these gifts, My dear children, for they are your salvation." She blessed us and left. "Dear children, as you begin the new year adoring My Jesus lying in the manger, I have come to ask that you surrender completely to holiness, by abandoning everything that is prideful. Holy Love, which is holiness, is the opposite of self-love, which Satan makes so attractive. Think only good of each other. Love each other as you love yourselves. This is the path of conversion and peace. I have come to ask the world to recognize and to choose. This is the year when indecision is decision. My Heart will triumph through your 'yes' to Holy Love. If you choose holiness you are already defeating Satan, who wants every soul to fall into perdition. I am imparting to each one of you My Motherly Blessing and special grace to help you to choose each minute good over evil." She motions towards Her Immaculate Heart with both hands, then leaves. Our Lady is here again in white. She's radiant. She's bending over me and says: "Let us give praise to Jesus. My little daughter, I have come once again to reveal to you the sure path of holiness. Holiness is love in the present moment, loving God above all else and neighbor as self. What hinders the soul from the path of holiness is pride. Pride is from Satan, pride is self-love. When the soul can surrender the past to love, and the future to love, and live in love, he is holy. Make it known."